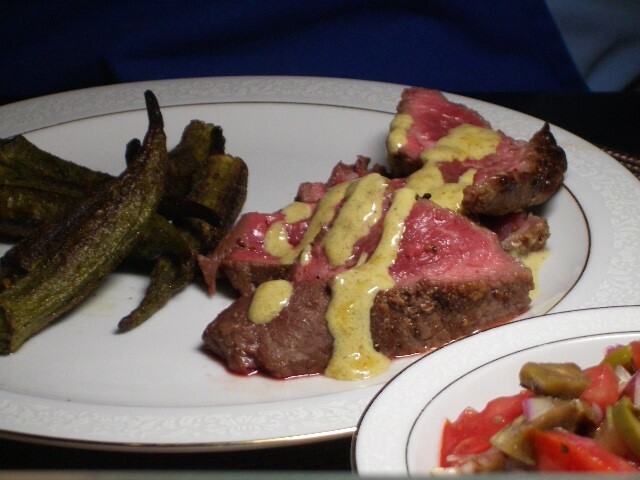 Recipes - Entrees - SIRLOIN STEAKS SMOTHERED WITH WHITE CREAM SAUCE - Salado Olive Oil Co.
Heat skillet over medium heat, press pepper onto steaks and season to taste with salt. Add 1 tablespoon of the butter and olive oil to skillet and cook steaks to your liking turning once. This is usually 2-3 minutes per side for medium rare. Remove from heat and place a piece of foil over the steaks. Pour excess fat from the skillet and reduce heat. Add rest of butter and shallots. Brown and saute for about 2 minutes.Add beef broth and deglaze pan, scraping the bottom of the skillet to get all the good flavor and bits mixed in. Cook till most of the liquid is gone. Add heavy cream and reduce till sauce coats the back of a wooden spoon. Put steaks on serving platter and pour sauce over the steaks and serve. Along with the steaks, I served a garden salad with Salado Olive Oil Co. Persian lime oil. Peaches for another color with Salado Olive Oil Co. White Peach Balsamic drizzled over them. This was a great and beautiful supper. Currently, there are no products matching this criteria in stock.